There’s few things better than being pleasantly surprised by a movie that you really weren’t expecting much from. 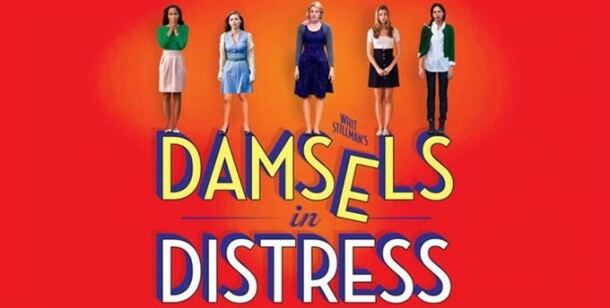 Such was the case with “Damsels in Distress”, a quirky comedy written and directed by Whit Stillman. It’s almost impossible to put “Damsels in Distress” in a box or compare it to any other comedy out there. It’s an entirely unique movie that’s driven by its slick dialogue, cleverly constructed narrative, and its own special sense of humor. It’s not a movie that will have you constantly laughing out loud. But if you’re like me, you’ll be smiling all the way through it. The story takes place at the East Coast college of Seven Oaks and focuses on a group of three eccentric girls with very unusual perspectives of college, boys, and life in general. Violet (Greta Gerwig) is the awkward and gawky group leader, Rose (Megalyn Echikunwoke) is Violet’s cynical long-time friend, and there’s Heather (Carrie MacLemore) whose peppy and agreeable demeanor fits perfectly with her two more verbal friends. The group finds fulfillment and purpose in things such as fashion and hygiene while making it their goal to enlighten and positively influence the degenerated student body around them. At the orientation for new students, the group almost forcibly takes a freshman, Lily (Analeigh Tipton), under their wings and makes it their mission to enlighten her on the keys to survival and achievement at the university. The first thing I noticed about the film was the razor-sharp writing. This is most clearly evident in the dialogue. The girls converse about everything from frat houses to soap fragrances. So often their conversations wander off into hilariously absurd directions but Gerwig, Echikunwoke, and MacLemore deliver their lines with a deadpan sincerity that sell it completely. Most of the groups goals and perspectives come from Violet and stem from her need to be needed as well as her almost desperate pursuit of purpose. She heads the campus suicide prevention center. She prefers loser guys, or “doufi” as we come to know them, because they need stable and calming forces in their lives. She wants to start a new dance craze because of the emotional value past crazes have had on society. There is an almost sad undercurrent to the Violet character. In with the genuinely funny moments are scenes that show her to be a pitiful, sad, and sympathetic person. In fact, Stillman uses a clever trick of baiting the audience into laughing at the girls and then having us feel bad about doing so. But there’s more going on that just this small group of eccentrics talking back and forth. We meet moronic frat guys who make the girls seem like Rhodes Scholars, a clinically depressed group who find tap dancing therapeutic, a self-absorbed Frenchman with a, shall we say, backwards religion, and several other side characters that work really well within the story. I also appreciated how this is a college movie that doesn’t cling to the conventions of most other college or frat films. I enjoyed the innocence and naivety that gives the movie a uniqueness and freshness that I haven’t seen in a while. “Damsels in Distress” certainly can’t be called a traditional Hollywood comedy. But it’s certainly a good one. That being said, I can still see where it may not connect with some people. It’s quirky and unusual but also impressively intelligent in its silliness. I couldn’t get enough of the bizarre conversations, the straight-faced line deliveries, and the playful look at college life. But there is also some heart mixed with the humor that surprisingly works well. I’ve watched “Damsels in Distress” twice now and found that it only gets better. It’s a movie that has flown under many people’s radar but it deserves an audience. Especially considering the number of subpar films these days that pass as comedies. This entry was posted in Movie Reviews - D and tagged analeigh tipton, carrie maclemore, damsels in distress review, greta gerwig, megalyn echikunwoke, movies. movie review. Bookmark the permalink. Nice review. I’ve read many good things about this film. And I like Greta Gerwig. It’s worth checking out. I’m thinking it has flown under many people’s radar. Funny but unique movie. I have only heard about “Damsels in Distress” recently. Seems like Greta Gerwig is everywhere these days. I might give this a rent. Oh Ruth you had to watch this one. It’s quirky and unique. It is also definitely outside of the box in terms of modern comedies. It won’t appeal to everyone but I really enjoyed it. ya know, I liked Greta in Arthur, but there isn’t that much appeal for me in this one. Granted, Russell Brand’s involvement in Arthur made me not want to watch it at first, but I ended up loving it…so, perhaps I should give this one a chance someday. I haven’t seen a lot of Greta’s work. (Greenberg was the last thing) but she was good here. But it’s the quirky material that really shines. I can see where it wouldn’t work for everyone but I got a kick out of it.